Geschatte leestijd: 38 minuten, of een enkeltje Utrecht - Apeldoorn. Since 2005 I’ve spent a lot of time working on web accessibility, which is crucial for any organisation that wants their web visitors to have an excellent user experience across platforms or devices, regardless their abilities. Government institutions in the Netherlands are legally required to have accessible websites. Again and again I’ve found that decentralised web management isn’t a effective way to use resources when creating a standards-compliant web presence. I’ve seen many governmental organisations from inside: municipalities, NGOs, ministries. I found that accessibility problems are caused by decentralised web management and a lack of governance. And there’s more. Whether it’s navigation, labelling, writing, or what I call the ‘homepage banner war’: I always observed smart people wasting time and energy in debates with subject matter experts, resulting in websites that continue to frustrate customers and citizens. This led me to rewrite my book ‘Het Geheim van de Overheidswebsite’ (secret of Governmental Website) in which I explain this in a detailed manner (and offer solutions, too). My conclusion after having devoured theory and categorised all fieldwork with my very smart colleagues Henk Boeschoten, Simon Besters, Tom Zeppenfeld and others: decentralised web management is an out-dated model from the last century that wastes money, is counterproductive and undermines the web presence and the organisation’s reputation. In order to do what we promise as an organisation, we have to shift towards a centralised web team staffed by professionals. It’s not easy, but it has to happen. If we’re going to meet professional standards, we need teams staffed with professionals who are selected, trained and paid to do their jobs well. A decentralised team made up of subject matter experts won’t meet those standards because they’re experts in other fields—not the web. In organisations where I’ve installed a centralised professional web team I’ve seen more effective websites and people working together to improve the online – and even offline – presence. People spend time improving communication, instead of debating with subject matter experts about messy content and fighting with the CMS all the time. The subject matter experts are happier too, because they’re more comfortable with their new roles. There’s more cooperation and understanding, resulting in better web performance. When I look back on my work on various web projects, I see a lot of variables, and at least two clear dimensions for classifying a web team. The first dimension is the web communication organisation: decentralised versus centralised. 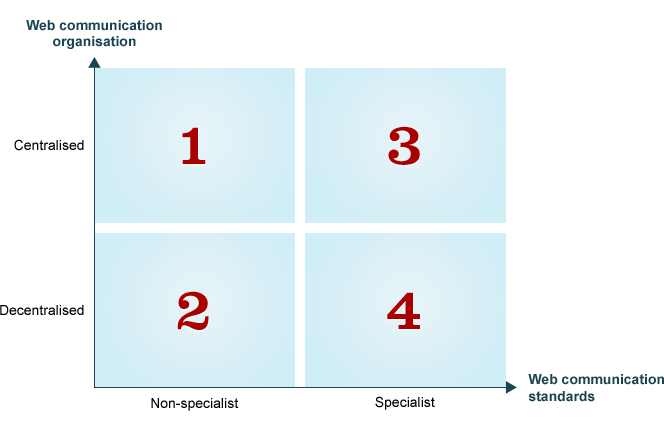 The second dimension is the dimension of web communication standards regarding web management and content: non-specialist versus specialist. Square 1 is the era of the good old web master from the nineties. This is the centralised non-specialist version of web management: a web master, putting up text in HTML, without being a content professional. The web master was the only person who could update websites. They didn’t edit and published exactly what was requested. People in organisations simply handed over content and the web master never asked ‘why’, but only asked ‘when’ or ‘how’. Later, when we got our CMS, most organisations went to the quarter 2 below. Those systems were invented to make editing easy. So everybody who could type text could use a CMS. The work went to people lower down in the organisation; people who could easily be asked to publish content, like secretary staff. In some cases the work was done by subject matter experts. They made web content as a by-product from other content they produced. Putting the text for print online (sometimes in PDF) was the next easy step for them. Of course, these people were all professionals in their jobs, but they weren’t web professionals. Organisations set up like this don’t have web standards, or if they do, don’t meet them. Achieving accessibility is hard and expensive in these organisations. The best this kind of web organisation can expect is a nice looking website, in a continual process of redesigns. Content always gets migrated and never deleted. People feel uncomfortable with the website the day it launches. These are the websites with ‘under construction’ signs. Gerry McGovern writes also about the effects of this way of organising web teams in his blogpost about decentralized publishing. The process itself is frustrating in a web project, because it is most times like the 11th hour sh*tstorm experience Karen McGrane writes so eloquently about. Can the web organisation move on to square 4? In the last years I have been asked to train SMEs and other staff in square 3 to become better writers and teach them how to apply accessibility to their work. Although almost all attendees understood what web writing is and tried hard, the training didn’t work. Mostly because people didn’t have the time to apply the new skills. But also, in all those sessions I encountered all kinds of justifications for why were not allowed to make decisions to change, delete or improve content. And it was really frustrating for all of us, including me. For most subject matter experts, working on the web is against their principles of doing a good job according their professional standards. I couldn’t ask a legal professional to write concise copy, remove text and skip details. I couldn’t ask a secretary to rewrite, not to mention delete, content from the project manager they worked for. In a decentralised organisation, writers think it’s important to write in detail and to serve their colleagues. To publish content before 5 o’ clock, today. But the web is all about serving the customer, being concise, relevant and customer oriented. To have oversight of the whole website and customer journeys through silos. This takes time these people don’t have and insights they can’t apply. So this situation ended up in blinking cursors and people gazing at their screens. Even changing a phone number without consent of a project manager seemed difficult. So in 2011 I decided not to train decentralised web teams any longer in web writing and I am still very happy about it. Because subject matter experts cannot apply the skills; because they fear the problem they encounter after my training with their professional peers. In other words, we simply cannot ask experts to undermine their own professional standards. But yes, there are other ways they can contribute to a better website in another role, their role as an advisor and expert. So, when we want to meet a professional standard, we have to change the people and the process part. We enter square 3. Working with centralised teams requires a whole other system and type of web professional. That worked out for the organisations I work for, even very bureaucratic organisations. I install new teams or train professionals in their new role they find themselves in. Working in square 3 means we can implement user friendly and task-oriented websites for our customers and citizens. In these focused teams, we keep track of things on and offline and work together with the people who once before were writers. Instead of letting them write, we help them in getting messages across in the right way. In my web projects, I start with content inventories and editing sessions. But that’s only the start of being the change we want to see. For a change of paradigm, we have to change methods too. So, for instance, I don’t want any web content emailed across the organisation, I want people sit at each other’s table and start a conversation over tea or coffee. That is not extra time, that is the time we gain afterwards simply by understanding each other professional point of view. For me, the website or online presence is the result of organisational questions that have to be sorted out first. When we do that well, and set the right steps, we arrive at a point where we can work on our better online presence, conversion and all other promises we make in our mission statements. Installing a team with web professionals and empowering them to make and implement decisions is a critical step. A decentralised web team will never make any decision that goes further than their own webpage representing their work. So we have to stop fostering or trying to improve that web model because it doesn’t serve our customer or citizen. We cannot make great websites when there is chaos of a malfunctioning web organisation. We end up hiring web writers, editors, consultants making quick fixes because we think that will solve our problems. It never will, unless we want to change the system. This is the point where ‘governance’ enters the arena. Governance is not so much agreeing on stuff, governance means acting upon stuff we’ve already agreed on. Only a paid web professional will do. We have to change our platform and maybe that will hurt. But hey, I am still alive and yes it works. It worked in Groningen and in other places in the Netherlands, so it could work with you, too. Changing a system means that you have to be conscious of the type of web organisation you work with. Find your self and plot your self. Be honest and realistic. Don’t try to fix the typewriter or carriage when you can have a computer of a car. Step into the new paradigm. Stay tuned, I will have more blogs coming and have older ones translated from my wieplog (www.wieperbij.nl) for you. Thanks Jonathan Kahn for editing, advising and inspiring! This absolutely reflects my experiences, as well — but it’s not limited to accessibility concerns. It applies directly to website development in general. Looking forward to seeing more in English on your site! Thank you, Christopher. And yes, I totally agree. This approach applies to all professional standards we want to apply on the web. For me, working on accessibility is just one of these standards, and a very crucial one. Thanks! And your response encourages me to write some more on this blog. Unfortunately, the myth of cost-savings — by expecting existing staff to somehow become writers/editors/strategists overnight, without neglecting current responsibilities — remains tantalizing to many.